If you’re not familiar with it, Beaver Island is the largest island of the great lakes, near the top of Lake Michigan. It’s has a rich natural ecology, and very interesting history including a religious monarchy. Stay tuned to learn more about this unique place, and the work the Ayers brothers are doing there. I hope you enjoyed todays episode. This is due to melting of the snow, and all the added duties that this time brings for a homesteader/farmer. If you really want to hear episodes more often, you can help us out by supporting us on Patreon. We really appreciate all of you, our supporters and listeners. Please help keep this Podcast on the air by becoming our Patron on Patreon. Our supporters get instant access to ALL the episodes plus scandalous BONUS content! Levi: Just before we started talking, I started looking up the history of Beaver Island because I don’t know that much about it. In the end, it has an interesting history. It’s pretty funny actually. Nate: You didn’t know about that. That’s great. Levi: I know of Beaver Island but I didn’t know the history of it. Just to connect a few dots, are you from Beaver Island? Nate: No, I’m not from there but I started going up there when I was about 5. It’s sort of a family vacation spot. Nate: Yeah, that’ll be something. There are still a few original families up there and they’ve got names like ‘Gallagher’, ‘McDonough’ and ‘O’Boyle‘ and things like that. They can definitely trace themselves back to the folks who came over during the potato famine in the 1800s. But then the other side of it, which I’m sure you’ve read about as well, is the Mormon history there on the island. Levi: Yeah, before the Irish came. So that was like the first settlers on the island. What was his name again? Nate: James Strang. The first and only King of the United States. Levi: The King of Beaver Island. Nate: King of the United States, he proclaimed. Nate: Yeah, King of the United States. It’s an interesting history, part of the Mormon Church. I think there’s a chance many Mormon’s don’t even think about this sort of side branch. It was like literally the west word expansion Brigham Young and Joseph Smith. It was Brigham Young that went further out west to Utah and there was a faction that split off led by James Strang and they went up to Beaver Island. Levi: And then just settled it. Nate: They settled it. They weren’t there for too long. It was interesting because there were still some old Mormon barns and stuff on the island you can go check out. But he displaced the Irish. Similar kind of history in terms of like he claimed he had found this sacred place and stuff like that. Long story short, he ended up upsetting a couple of his followers and I think he was done in by his own people. Levi: They tricked him and then shot him in the back and then they hoofed it over McDonough Island to escape and they never even got prosecuted or anything. I think there was some general negative sentiment amongst the other inhabitants of the area, perhaps. Nate: The super interesting history that I’ve been trying to get more in touch with the past couple years is there’s all kinds of native and indigenous history up there. Particularly, there are some stone circles that had found up there that they think are really old. Sort of associated with the Mound civilization which was almost pre-first people in this part of the world. The main tribes in this Michigan area, I think, were the Chippewa, Odawa, I’m forgetting the last one but this Mound civilization was almost pre-first people, first nations. They found all kinds of like calendars, their Astro calendars. They’re thousands of years old and they’re up there on the island. I’ve seen them. It’s really, really fascinating history. They say that there’s more of that kind of stuff at the bottom of Lake Michigan. They found a few other calendars and stone circles and things like that. You can kind of connect that a little bit with some of the history that they found of the copper coming from the Upper Peninsula. They have found that copper has a really distinct chemical signature. They found that copper all over parts of ancient Europe. They think there were people who are coming to that part of ?, actually are like a Greek civilization that came and got Michigan copper, at that time the copper that we now call Michigan, and took it back to Mediterranean Europe. Levi: We’re talking like thousands of years ago, right? Nate: Yeah. Way, way before even Vikings potentially came here. They think Vikings came here way before Columbus and all that. It’s a ball of yarn but it’s really interesting place. The Island kind of feels that way and I’m sure you spent time on islands before and there’s an interesting feel. There’s lots of people who go up there to Beaver Island and try and make a go of it and places like that reminds me of places like Sedona and Big Sur where it’s just raw nature. Sometimes the island embraces you and you have a great time and other times the island kind of chews you up and spits you out. Levi: Was the island always an island ever since the glaciers or was it ever connected to the land? Nate: That’s something I should know but I don’t. The longest modern lore is that it’s been a fishing baton for a couple thousand years, at least. It’s a pretty big chunk of land. It’s 13 miles long and 6 miles wide. Levi: Oh yeah, 55 sq. miles. That’s big. Nate: So I think it’s been around for a while. Levi: What kind of wild life is on the island? Nate: Interesting enough, there’s a book that I read called fauna of Beaver Island, which is written by a professor from CMU. Central Michigan has their biology station there in Beaver Island. In that book, he talks about how Beaver Island has every type of ecosystem found in Michigan, all on that one island which is really unique. All the classics, “Dear Turkey’, and stuff like that. There’s some really special– obviously, beavers as well– but it’s a bird migratory path so you’ll get really special. I see the American kestrel up there all the time and of course, they’ve baldy’s and gold eagles and things like that. The birding is really phenomenal up there, really phenomenal. Levi: Your new project and your brothers, “We are the forest”. Nate: “We are the forest” is kind of the culmination of everything I’ve done for the past 8 or 9 years, starting with our permaculture. For me it was a lot of two-steps-forward, one-step-back in terms of how do we get this stuff into schools, trying to find the right partners in schools that would even listen to me about permaculture? Through a bunch of trial and error and different pilots and research projects, really finding the right ingredients that made for a successful and engaging K2-12 curriculum. What’s interesting about this “we are the forest” is this is an outgrowth of some consulting work I did without mutual friends, the Archangel Ancestry Archive. They essentially hired me to create their educational programming. In the course of doing that I came up with 2 different programs. One was called “Tree School” and one was called “We are the forest”. The one ended up making a lot more sense for them was the “Tree School” one because they had this huge facility and we sort of re-did the facility to be kind of place-based and interactive and of course, they had thousands and thousands of trees going there. The Tree School was an actual fit for them. When the funding ran out, it was time for me to go do another project. I was kind of “Well, maybe I’ll take this “we are the forest” thing with me and see what we can do with it.” so I brought it back down state and I started piloting it with a couple different schools around here. After about a year, Eastern Michigan University picked up the project and started sponsoring it. Eastern has a really wonderful education program (nationally recognized education program for creating new teachers). Within that school of education, they have an awesome little non-profit called the SEMIS coalition– Southeast Michigan Stewardship initiative. They are really at the forefront of place-based environmental education. So “we are the forest” became a pilot project and they put me into Detroit public schools and Ypsilanti public school and a few other public school. What’s interesting about this “we are the forest” project is I don’t use the word permaculture at all in it. It’s not by any means trying to ignore what’s permaculture is about but in my experience, I found that municipalities and cities and the working industry, green infrastructure folks are much more familiar with words like eco-system services. There’s 3 main concepts to “we are the forest”. Its ecosystem services, biomimicry and green infrastructure. Interestingly enough, all those 3 things are very much so permaculture related but in the context that we use it, we teach those 3 aspects of essentially community design. We end up using the schools that we work with as the laboratory to install new green infrastructure to install new forests around the school. We are some pretty cool software along with this program. We use a particular type of software called “I-tree” which allows us to take some pretty simple field measurements about circumference and height and tree equality and you can plug this into the ‘I-tree” database and it will spit out all kinds of economic data about how much money that tree is worth. When you put this in front of 3rd through 12th grade students and you start talking about how much money nature is worth, that’s a very different kind of net you’re casting than a lot of environmental education that we’re typically used to. Can’t seem to be interested in money so if we can put this kind of spin on the ways that we care for nature and all the services that nature provide for us, we can put a dollar amount on that and your arm kids with these tools and send them out and say, “let’s go find the most valuable tree on our campus. Not only that, let’s find the locations around the building that are gonna be the most economically valuable for us to plant new trees.” We’ve got these ingredients for getting kids outside learning about the environment but also learning about stewardship and creating new models of ecology that create habitat around the school that sequester water, that sequester carbon. It ended up being this extremely engaging project that most of my attention now is being spent on “we are the forest”. It’s fine with me. I love it. Levi: That sounds like an awesome project. One thing you were saying about how kids are really– by showing what the ecosystem services are worth in a cashed dollar amount, it helps connect the kids or helps them understand their value there. I think also probably a big piece is convincing the administration or the people who decide on budgets to look at those numbers and realize that it’s worth investing in this green infrastructure. It’s worth planting these trees along this side of the building to shade the walls so it doesn’t get so hot or something like that. Nate: That’s exactly right. In this project, we have the students make presentations to either the grounds crew or the school administrators of their school. It gets into exactly what you were talking about. Sort of the energy savings associated with trees on the south side of the building and things like that. To have the students go to the administration saying, “This is the most valuable tree in our campus. We can’t ever cut this down. Not only that, we need more trees like this and we figured out where to plant them.’ It puts the administration in this unique position where they’re being pretty strongly politicked by their students to plant new trees around their school. It’s tough to say no when you have 20 students saying, “Hey, we have to do this this year. This is for our future.” It became this very powerful advocacy tool to get new trees in the ground. Levi: That’s awesome. That’s perfect. It’s one of those well integrated systems that is working on many different levels. I just love to see those kind of designs. Nate: I think you’ll appreciate it, too. A big part of it is we bring in the arts and movement. Movement is a big part of it as well. This is kind of in the realm of ecosystem services and biomimicry. We’re talking about what’s the true value that nature provides to us. I’m a musician, I’ve been playing music for a long time. Sometimes, I say I’m a funk musician masquerading as a permaculture designer but I bring in a set of drums. I’ll bring in a guitar and stuff like that that’s so clearly, obviously made out of wood. That’s so clearly, obviously comes from the forest and talk about how this is a part of our culture. This is a part of our history. This is a part of our stories that we tell that we, as humans, have been telling for thousands of years that we get this stuff from forests. We get these musical instruments from the forests. So this is sort of reframing the value that we get from nature and way more accessible context for students. So to come up there with a drum set and play some hip-hop beats and have the kids come and rhyme over it or sing over it or have them write a story that involves music and things like that, it makes these stuff a lot more accessible and tangible to think about. This is another value that we get from nature that we don’t normally account for. So that’s a big part of it, bringing in the arts and that’s something that I’m super passionate about. But then on the movement aspect, and this is something that I know you care about a lot, a great deal, we get kids thinking about the functions of trees in terms of respiratory functions and how our lungs just look like a tree’s branching system or it’s root structure. They bring in that kind of bio mimicry aspect of it. But then literally, the respiratory component that trees play for us on the earth, we bring in this mindfulness meditation aspect of it and we’re really starting to think about how our breathing slowly and mindfully mimics the ways that trees in collective forests provide the functions for us to be able to be here. So that’s a big part of the movement aspect of this but then the other side of it is when we get outside, we like to really move our bodies and we develop this game. It’s a frisbee-based game that we call “grisbee” which started out meaning “aggressive frisbee” but now it just means “grand frisbee”. This is a game that we bring in all kinds of interesting geometry just starting with the basic circular shape of a frisbee but then moving that into this kind of hot potato dance movement of how fast can we pass this frisbee. Can we pass two frisbees at once? Can we pass two Frisbees using two different arms and things like that? So really trying to bring in this dual hemisphere sinking nature of the right and left side of the brain through movement and activating our bodies. It’s really interesting to see a group of kids starting chucking around frisbees at two o’clock in the afternoon in the name of bringing their brains together and hemisphere in sync but it kind of works. Levi: That sounds like fun. I want to play sometime. Nate: You’d be a pretty good player. Levi: Maybe. I feel like my frisbee skills are lacking a little bit versus other areas of athletics. In my experience working in schools and putting in forest gardens on school grounds, one of the issues with usually the groundskeeper is explaining that– for them it’s so easy to mow just a big open patch of grass but if there’s a bunch of trees and plants and borders and pads then that’s a lot harder for them to manage and maintain. I was wondering if you came across that same concern and how you responded to it. Nate: It’s a thing that we have to deal with every site. Each school is different and you’ll find different levels of acceptance for this stuff at different schools. This sort of gets into, like I said, we had students make a presentation to what we call the stakeholders. The stakeholders are usually the school administration and the grounds crew. We talk about how planting these trees are gonna solve a problem that they have. So I’ll give you an example. When we did this at Ypsilanti high school in November of this past year, the school was having some serious flooding issues around the foundation and things like that. So we designed up a system of native tree planting that was far enough away from the building so that it took into account the grounds crew’s mowing schedule. The number one thing was ‘we don’t care what you plant around the school, just keep it 12 feet away from the building so that we can fit out mowers in there’. It’s like, ‘okay we can stick that’. But then when we framed things in terms of if we plant these trees right, it’s gonna help dry up these wet spots that keep sinking your mower’s tires and things like that. So now they’re really on board because A) we’re going to mark these trees off of flags, maybe a little bit of signage and make it clearly visible that this is an installation that’s here. We shouldn’t be mowing this over; but B) it sort of get them on board and say these trees are actually solving problems that the grounds crew has to deal with on a regular basis. That sort of frames it in this win-win type of system that the students present their findings. They’re doing an installation that’s solving a pressing need and also brings the grounds crew in and say, “Hey, we’re trying to help with some of the issues that you guys are dealing with, too. These trees can help.” So we frame things in terms of pitching these projects to the stakeholders. If we can find stuff that is a bit of a hook for the grounds crew in the school– a lot of times schools don’t like to plant fruit trees and stuff like that because they think they’ll be cleaning up all this fruit in the fall. but if you couple that with some kind of a harvesting program or parental volunteers and say ‘this two weeks of school we’re gonna harvest these fruits and we’re gonna donate half of it to food gatherers and the rest we’re gonna have for school lunches and we want you to join us that day that we eat this stuff’. Any way we can find to bring in admin and grounds crew, it helps to alleviate some of that initial push back instead of just ‘oh, this is more crap for me to deal with’. Levi: It’s great to get everybody on board to understand the bigger picture. So speaking of the bigger picture, you have here on your site something about how beavers can save the world and that really peaks my curiosity because I want to know how beavers can save the world. Nate: So this was a course that I put together to train teachers in place-based education. Since I was about 10 years old, we’ve been taking hikes on beaver island and finding all kinds of beaver dams in various states of used and abandoned and things like that. I’ll never forget the first time I saw beaver on Beaver Island just swimming around in the dam that they had made and it was just slapping its tail hard on the water. It made such an impact on me. I cut to maybe 4 or 5 years ago when we first started hearing about [00:20:54] and these [00:20:55] culture systems that he was building and bringing to the States. I was walking on top of one of these beaver dams and I happen to look down on where I was and I noticed that there was just this black, rich topsoil shooting from underneath the beaver dam. It got me thinking about the similarities between a [00:21:15] culture bed and a beaver dam. They’re literally the same thing. It’s buried sticks, wood, organic material that over the course of time ends up catching storing all kinds of organic material, plant root matter, things like that but breaking it down. It becomes its own composting system that inevitably starts producing its own topsoil. It was like this huge light bulb moment for me that beaver dams are nature’s [00:21:44] culture. The ones that I kept seeing on Beaver Island already had raspberries and all kinds of other wonderful stuff growing in them. That was sort of this lesson that I just tucked in my pocket for a year or two and then I started learning more about biomimicry and systems thinking and some of the models that beavers use to essentially create new ponds. The main functions that beavers provide in an ecosystem is to create overland water flow into under land water flow. This is huge if we’re talking about creating water absorbing landscapes which is so fundamental to permaculture and Agro-ecologies catching and storing energy, catching and storing water, things like that, keyline design. Beavers are amazing landscape restoration specialists. They created these little systems of beaver dams that catch and store water and they keep that water that would normally be flowing overland, either through a rain event or through snow melt, and through catching and storing that water and letting it seep down into the aquifers and channels beneath the soil. They create that water into under land water flow. That really sets the stage for habitat creation and for a new ecosystem. So beavers really do help create drylands into wetland burgeoning forests. The class itself “how beavers can save the world” looks at the specific solutions that beavers have for us, from everything, from how to fix droughts to how to work together as a democratically organized structured system. Being that beavers set the foundation for all other kinds of animals to come in and take root and do the work that they need to do. They’re really geological engineers. That’s kind of the essence of what that course is all about. It’s really examining the ways that beavers work on the landscape and pulling those lessons out into some areas that us humans are having a lot of problems with, namely ecosystem destruction, topsoil loss and erosion, food production systems. The way that we design our communities and our organizations, a lot of times they’re top down and we want to know how fast they can get as quickly as they can. They don’t take into account creating space for all the other people, ingredients, elements that we need around us in order to truly be successful at a community level. Those are really important lessons that we can pull from beavers and that what that course is all about. Levi: So the event that’s coming up, the Beaver Island eco-fare, is that gonna be a theme or side theme? Nate: Yeah. That class is a part of the eco-fare. The Beaver Island eco-fare is a new event we’re launching this year that came out of the first year of doing that “how beavers can save the world class” last year in 2016. So we did the class last year and it was really fun. We had a good time and we sort of all got together at the end and we were like ‘let’s try to go bigger next year!” The eco-fare is something like a partnership between “we are the forest” and the Beaver Island music festival. For your listeners that are thinking about going to Beaver Island, I can’t recommend enough going during the music festival. It’s one of Michigan’s truly great family friendly but also just having a great time in the woods’ music festivals. That happens in July of every year. But what we’re going to do this year is a month before hand we’re gonna have this eco-fare and a big part of the music festival and “we are the forest” is renewable energy, using it whenever we can. The Beaver Island’s music festival is totally renewable powered. But we wanted to have a day that was specifically dedicated towards these types of solutions on Beaver Island. That’s what the eco-fare is. “We are the forest” beaver’s class is happening that Saturday, June 24th, during the Beaver Island eco-fare. So June and July, all kinds of cool stuff happening on Beaver Island. If you get a chance to make to any of that, we will certainly show you a good time. Levi: Just to put in the plug for more information, you’ve got your website wearetheforest.org. Nate: That’s the one and you’ll see on the landing page there there’s a little button: how beavers can save the world and you can click on that and find out a lot more about what’s going on in the island this summer. Levi: One other little thing along that same thread you’re talking about the beavers and storing water in the landscape rather than letting it flow down into the lakes and ocean quickly. Is the story, this work that was pioneered by Michal Kravcik in Slovakia, have you heard much about this? Levi: This is something that Peter Bane recently has been bringing to light and shared with me in a recent podcast while he was researching his new book which was all about how restoring the hydrological cycle can be a key solution for reversing climate change. By increasing the water in the landscape, its increasing photosynthesis because more water means more plants, more life. Of course, where there’s photosynthesis, there’s soil being built and there’s trees being grown and that’s all storing carbon in the landscape rather than in the atmosphere. That’s really exciting stuff but this project in Slovakia was basically a great case study and actually pretty large scale (I don’t know how many miles but its many, many square miles that they did this to) where they were having flooding issues in their mountainous regions. So what they did is instead of building huge dams with concrete, they just hired a lot of local people, not like skilled engineers or anything, but just local people to build very simple small leaky dams which are basically called check dams and that’s basically what a beaver does. It builds a leaky dam but it slows the water from flowing down through the valleys where it can pick up speed and start picking up rocks and particles and causing the erosion problem. It slows it down and holds it back just long enough so it can start to soak in the ground and go down to the water table like you’re describing. They’re doing this really high up in the water table so that where the creeks and the streams are still really small. So they can do it mostly by human skill tools. They use a little bit of machinery, too, but mostly they’re just using logs and rocks and stuff that’s kind of around and then laying it somewhat strategically across the flow of the water. They did this on a huge scale and they’ve got numbers behind it. They’re showing that it’s drastically reduced the flooding problems and also, there’s other interesting information. I think there’s increase rainfall or something. I got to double check that. There’s all these other follow up side effects that they didn’t even expect that are really beneficial. That might be another good piece that the beaver effect reminds me of it. Nate: That makes sense. Just from my limited research on the hydrological cycle, I think what folks are really starting to realize is that trees bring the rain. There’s a reason why deserts are dry. There’s no trees. this gets into some of the work that Archangel was doing out in the west coast with their vision of really reforesting the west coast and America’s coastlines with these all growth genetics. When you look at the ecological functions of a coastal redwood tree, it’s literally a rain harvester. It pulls fog from the Pacific Ocean and enters that water into the terrestrial-based hydrological water flow. Those trees are actually water magnets, bringing water from the ocean onto the landscape. That makes total sense that they’ve increased rainfall as they increase and trees start to grow up in their succession processes. That sounds really cool. I would love to learn more about that. Slovakia, is that where it is? Levi: It’s theflowpartnership.org, it’s a good resource for that one. But I know that your brother, Nick, is into this and is basically your partner on the project “we are the forest”. I was just a little curious about your guys’ You’s Guys, relationship and how you both have this passion for the natural world. Nate: Yeah. A lot of it we trace to going to Beaver Island when we were kids. When you’re like 5 or 6 years old, those family trips to the woods, to the cabin and stuff like that, sometimes they’re not so much fun and you’d rather be home playing video games with your friends and stuff like that. But as we matured a bit and became adults, we really started to treasure the time that we had up there. The thing about a lot of parts of Northern Michigan and Beaver Island in particular is that it’s just raw. You can take a walk into the woods and you’re in the middle of it. It’s the truth and you feel it when you’re there. The inspiration for this project definitely comes from our lifelong relationship with the woods and the forest on Beaver Island. Through my work and doing permaculture stuff and particularly creating curriculum for K2-12 and college, I was always hungry for ways that I could bring in arts and movement and stuff like that and do it. That’s really what my brother’s specialty has been for years. He’s a professional musician and a movement specialist and a breakdancer and all these other great artistic stuff. So when we first started doing the curriculum, the huge piece of it was bringing in these instruments from around the world and talking about the different forests that these instruments came from and how those cultures revered and respected the forests. That’s really how the organization and the project got at start was bringing together these things that we’re both really passionate about and sharing it with kids. With different groups, different parts of it resonate more or some kids really like the music and some kids really like going outside and planting trees. But the idea of being cast this wide interdisciplinary net of things that are all related to, all the good stuff that we get from the forests and from ecosystems in a way to make kids care about it. If we have to associate the dollar value with that, that’s not a bad thing. I’ve been saying for a number of years that sustainability might come down to accounting in a way that we’re keeping our books. This program is really trying to wake people up to that. There’s so much that we take from nature that we don’t put into our business ledgers. The impact of our fashion industry, for example. There’s data saying that this is the second most environmentally destructive thing that we do behind agricultures, the clothes that we wear. When we can take into account like, ‘who made your clothes? Where is that coming from?’ All the dyes that go into that. Can we put good ecological data on that and start to look for companies that don’t have as hard as the impact or companies that I’m really interested and this re-purposing in the textile industry. I found this company called Thread International that has a factory down in Haiti and they pay people in Haiti to go collect plastic bottles. Water bottles that just wash up on the shore and they have a proprietary process that turns these plastic bottles into cotton-like thread and they make clothes out of it. Levi: Why is it a proprietary? That should be open-source. Nate: I guess it’s proprietary to them. I think that their whole thing is making sure that they’re taking care of the people that they work with in Haiti, first and foremost. It’s a start-up. I think that they’ve got bigger plans. But that kind of model to me is just so cool in terms of ‘hey, let’s remove plastic pollution, let’s give people in developing nations good jobs and let’s feel good about the clothes that we’re wearing knowing that it’s reducing wastes and not polluting and chopping down trees and stuff like that.’ That the kind of accounting that we all need to be familiar with. So any way that we can introduce kids to that were for it. So that’s kind of why the breath and scope of this “we are the forest” program is so broad and so inter-disciplinary because it’s really all related. Levi: That’s beautiful. It all ties back to your childhood, too. It’s clear that you have that deep love, that deep passion, that life love that you can share with the kids and with everybody. It’s all great. Nate: It’s our story so the heart ties are there for sure. Levi: One also to throw out there is you mentioned buying from responsible companies and stuff. Also, you can try raising some sheep and harvesting some wool. Nate: Or some industrial hemp would be nice. It’s very soft fabric. Levi: Interesting, yeah. Is there anything else that you wanted to share? Nate: One of the things that I wanted to touch on real quick, not too much time, but I was interested in talking with you a little bit about the chapters of life that we find ourselves going through. One of the ones that I’ve been involved in the past 8 or so months of all these craziness that’s happening in the United States in 2016 and now 2017, is really talking about this intersection between life and art and work and jobs and things like that. Part of this is related to “we are the forest” work because it’s really about finding meaningful, life-affirming connections to how we spend our time during the day. It’s something that I’ve struggled with for a number of years and I was professional musician for about 15 years but when I was 30 years old I got burnt out. I couldn’t do it anymore. I couldn’t play in clubs every weekend until 4 in the morning, getting into fights with managers about getting paid. When you did get paid, it wasn’t much money. Even though I was this passionate musician and loved music, I couldn’t do that work anymore. That work wasn’t rewarding to me anymore. I found permaculture and this was in 2008 and gave my life over to that for a number of years. Every once in a while, somebody would say, “Nate, don’t you miss playing music?” I would kind of laugh it off. Of course I miss playing it but there was this chip on my shoulder about getting burned by the industry and things like that. So cut to this past year in 2016, the election and what that has done in this country in terms of how we communicate with one another but also I think if anything else it’s been a catalyst for people to ask themselves, “What do I want to put my energy into? How do I want to spend my time? What do I want to do while I’m here? Do I really want to spend my time fighting, writing letters to Congress, fighting tooth and nail everyday for the values that I believe? Is there a better way? Is there a way I can express myself more creatively?” Ultimately, it really lead me– Right around June ?, it became to me that we sort of entered this new territory (in this country at least) where words just don’t mean what they used to anymore. What’s interesting now is the past couple of months we had this dialogue in the United States about fake news. I’m really interested in this because, a lot of people might not realize this, I see a lot of similarities between this concept of fake news and actually what’s emerging in quantum physics. We have this idea in quantum physics where the act of observing changes reality. I think really what we’re getting at with this idea about fake news is that reality is an inside job. Truth is relative. One person’s truth might be another person’s lie. This is all kind of a much bigger dialogue and a much bigger discussion about why aren’t we teaching people how to follow their bliss? Why aren’t we teaching people how to speak their truth through the arts? Through their create endeavors? Are there dialogues that need to happen around asking ourselves what we truly want and expressing that creatively? This is something that I think is happening right now in Detroit. I think it’s happening all over the world but I see it a lot in Detroit. There’s a particular author that really spark my curiosity around this a few years ago. We might have talked about it the last time we talked, Levi, of ? who has a website called New Culture, New Work. He starts to ask these questions about a place like Detroit where there’s just super high unemployment rates and there’s so much work done. There’s all this work and there’s no job. How is there this disconnect? Social speaking, economically speaking, why is there so much work that needs to be done in the form of building roads, cleaning up abandoned communities, building new communities and there’s no jobs doing that? There’s this huge disconnect between jobs and work. There’s this huge disconnect between jobs and work. There’s this huge disconnect between what people really want to do with their lives and finding meaningful work that’s scratches that itch. This dialogue about how do we stop and ask ourselves what we really want? How do we get quiet and ask ourselves how we go about doing that? It really relates to a lot of this work that we’re doing right now with “we are the forest” which is presenting art, life, work all in the same umbrella. Your life should be art and your work should be your passion. Community building should be everybody’s responsibility and we can do so in ways that don’t feel cumbersome or like volunteer work. In a way, these are all just big questions that I’m asking but I think we’re in new found territory for us in the united States where we’re gonna see the loss of more and more jobs through automation. We’re gonna see more and more people who are struggling to ask ‘Why am I here? What am I supposed to be doing with this life?’ So people that have the need for connection would really benefit from things like meditation and different types of holistic practices. But also, how do we create avenues that allow people to follow their bliss and follow their creativity, follow their artistic desires in ways that ultimately benefit the community around them. I certainly don’t have hard study answers to these questions but I think this is stuff that permacultures have been talking about for years. I sometimes think that as permis, I get the sense sometimes that we’ve all been surfing on these very deep waves that are way out in the middle of the ocean and they haven’t even made their way to land yet. So the universe that you and I have been in and people like Peter Bane and Mark Baker and all these Australians, it’s like we’ve been out there floating around these ideas for a long time. Sometimes I think permaculture is past it’s prime. Something else is gonna come and then there’s time where I think ‘I don’t even think it’s made it’s way to land yet’. I get hints of that because we see in the youth and in the festival scene now. Permaculture is just making its way there now. Permaculture and these permaculture action days and things like that are just making its way to these cultural creatives and burning man and things like that. I feel like the things that we’ve been grappling with for the last 10 or 15 years are now just starting to make their way to the broader population. I think, if anything, permaculturists and biomimicry specialist and community farmers and artists and artisans, we are the ones that are gonna have answers for the rest of society when we all lose our jobs or everything goes to automation or the food systems really take a big hit either through drought or flood or things like that. Again, this is kind of a long winded soliloquy about the intersection of work and art and nature and play. I’m really grateful for a lot of the dialogues that I’ve had with people like you over the years, Levi, because I think when these ideas really do make their way onto the broader sense of landfall, we’re gonna need to step it up even more and share these experiences that we’ve been having and creating our own little islands of sustainability with the broader population. What do you think? Levi: I can’t really follow that up. Those are some beautiful visions, for of all, so thank you for sharing. I can definitely see what you’re pointing at and I can feel what you’re getting at for sure. I kind of figured like, maybe we’re not 50 years ahead of the game, but we’re probably 30 or so years ahead of the game here. But I think it’s important now. It comes in waves. I think that back in the 70s, when the US had its peak oil moment and there was all of a sudden the shortage of energy or oil and whenever those moments happen, it seems then it creates a wave in the culture a movement back towards simpler means and simpler ways of life. It’s funny to say simple because actually if you’re just sitting in your house and then you drive to work and then drive to the grocery store and come home or just eat pre-cooked meals, really that’s a pretty simple existence. It’s not very rich. When I say simple, I’m meaning technologically or mechanically simple, not as tied to the very large global systems for it’s maintenance or its resources. Nate: I hear you though. The interconnecting of a local community and involving yourself into local thread rather than huge, multinational, international supply chains, it’s a simpler way of being. Levi: I guess its simpler in a certain way. So there are these waves that come and the 70s was an example. Now, it seems to me that this happened again in 2008 when there was a housing market crash. There was just not enough money going around in the economy for people to take care of the basic needs or at least, it was very difficult. In those moments, people started looking for alternatives and that’s where they start discovering things like permaculture or homesteading or community organization, coops, tool shares, time share, local currencies, all these stuff that we always talk about. But those are kind of key moments because I think they help set the stage for the next waves that is to come. Back in the 70s, from just my experience with a lot of organic based companies or companies whose values are very earth based or all natural, organic valley, food coop would be a good example, a lot of them got their start in their 70s when there was this sudden realization of the limits of the natural resources and how it affects every aspect of our daily lives, how dependent we are. Then those little companies that got their seed back in that moment slowly and steadily grew kind of in the background of cultural awareness but then when another one of these waves of reckoning, you could say kind of washed upon the shore as you were saying. Then it motivated more people to actually support those companies that had already been building and preparing so isn’t it wonderful that we have a good healthy set of options. Now there’s even a stronger movement towards local foods and organic foods and so forth. That’s just helping those companies and those types of companies to grow more. I think it just comes and goes in and out of mainstream cultural awareness but it’s all just building in the background like the grassroots that are growing up. I guess it remains to be seen how it’s all gonna unfold or how the waves are gonna continue washing in but it seems inevitable to me that they’re just gonna keep getting bigger until there’s some critical mass moment where it just sort of flips the switch and shifts from being the exception to being the norm. Nate: I think you’re right. That’s well said. Levi: I see it’s coming from two directions. There’s me and all my experiences and inclinations and what I’m good at inherently but then there’s also systems of the world that I’m integrated with and plugged into in various ways. I think we both have the understanding that those systems of the world generally need to change a great deal which also implies that we, ourselves, need to change a great deal. So in that intersection I’m also looking for the points of greatest effect where you can put in the least amount of effort and you get the great effect for what you’re doing. If you apply yourself properly in an integrated way, then you can end up with the positive effects or repercussions of your way of being can have bigger waves than you’re sort of echoing out. I think we used this metaphor the last time we talked to, the echoes. Nate: It all comes back. You’re reminding me of the metaphor that I’ve been using lately or at least have used for a couple of years is this idea of pots on the stove. We’ve all got these pots on a stove full of water and some of the pots are big and boiling and some of the pots are little and we don’t have to pay too much time to them and things like that. I’ve found that as I get older, the real skill in all these stuff is being able to combine pots and somebody like you who has so many talents, athletically, intellectually, web design, farming and all these stuff, do you think about all those different pots on the stove and they’re all at very differing degrees of fullness and temperatures and stuff like that but as we get older, how do we start to combine those pots into one bigger pot so that our life is really a reflection of all these things that we love and we haven’t had to sacrifice anything. We haven’t had to get rid any of those pots but we figure out different ways of being in the world, of working with the world and expressing ourselves and doing our work and doing our service. So to me, the metaphor that’s been making sense lately is how do I combine my pots on the stove? 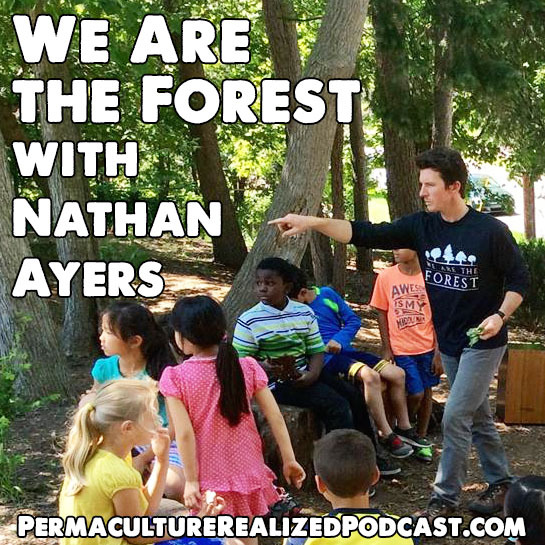 I guess to bring it all together and what we’re talking about here that for me, “we are the forest” is a way to bring together the arts, the music, the permaculture, the sustainability, the education for kids. It’s a lot of my pots that I combined into one. Levi: That’s brilliant. That’s it right there. It’s very clear and you bringing all the pieces back together as they each find their own unique place in this grand meal that you’re cooking up your whole life long. Levi: You better have bacon.